Whether it’s bubble baths or before bedtime snuggles, create lasting memories for a healthy baby development with our extensive range of baby cleansing wipe products. Discover the wide range of JOHNSON’S® Baby wipes that gently clean your baby’s delicate skin and leave it moisturized and smooth. Your baby’s gentle skin deserves to be cherished that’s why JOHNSON’S® baby wipes have been constantly upgraded to meet your baby’s skin needs. 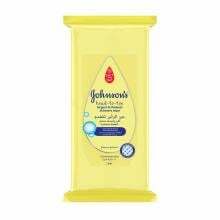 JOHNSON’S® Baby Wipes are larger and thicker wipes that are gentle enough to frequently clean baby’s skin, including bottoms and hands without leaving unwanted residue. Produced with natural extracts and ideal for everyday use, JOHNSON’S®Baby wipes are pH balanced with 0% Alcohol, Paraben and dyes.